It's nice when accessories match or complement an outfit, but it's unrealistic for most people to go out and buy a new purse for every outfit they own. 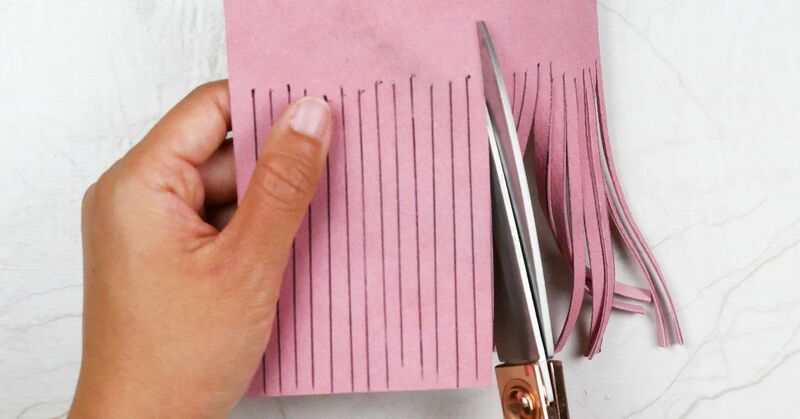 This craft teaches how to make leather tassels that are easy to put on and remove from a purse. Wearing pink shoes with a black dress and purse? Pink tassels added to the purse would tie it together and bring a pop of color above the knees. Make shorter or longer tassels depending on the size of the leather pieces used, and make the fringe thinner or thicker as desired. 1. Place the leather square so the suede side faces up. 2. Measure 1-1/2 inches down from the top along the right side. 3. Draw lines from that point to the bottom of the leather using the ruler and a pen or fabric marker. Repeat this at 1/4-inch intervals until you have marked where all the fringes will be. 4. Cut along the lines. 5. Take one end of the cord and glue 1 inch of it vertically, 1/8 inch in from the right side of the uncut part of the leather. 6. Roll the leather once over the glue and press down. 7. Squiggle more glue along the uncut band, stopping 1/8 inch from the left side. 8. Turn the leather so the fringes are horizontal. 9. Tightly roll the leather away from you, as if you were rolling up a sleeping bag or poster. 10. Repeat Steps 1 through 9, attaching the leather to the opposite end of the cord. 11. 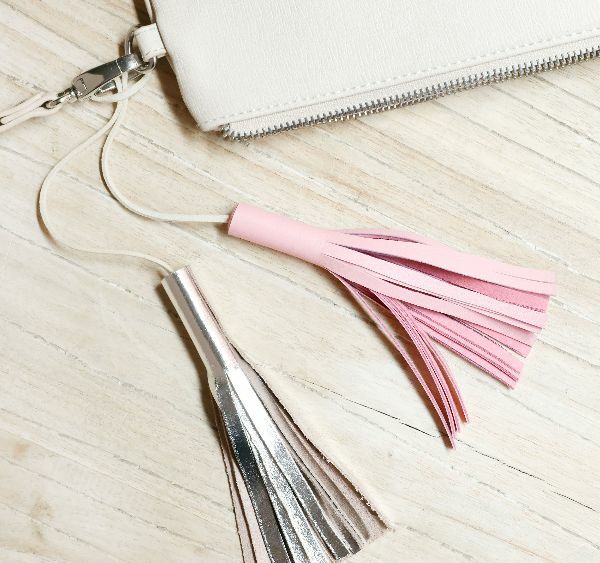 After the tassels are dry, tie them onto your purse.